Our property development consultants were appointed by Wood Group Ltd to provide commercial planning advice and commercial property disposal advice for a former BMW garage in Odiham. Drawing upon internal planning expertise, Vail Williams confirmed that redevelopment of the premises would be possible, subject to respecting local Conservation Area requirements and retaining some employment space in the form of a local convenience store. 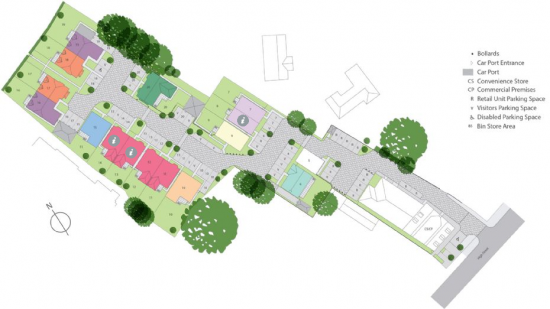 Following a review of the site, the commercial property development team recommended that residential use for the 1.6 acre site would deliver best value for the client. Rather than secure planning consent to then sell, the preferred strategy was to offer the site on a ‘subject to planning’ basis enabling potential buyers to secure planning for their optimum mix of units, and hence secure best value. Taking into account the client’s objectives, the team carried out a comprehensive marketing campaign which resulted in a number of robust offers for the site. As a result of the advice provided by the commercial property development team, terms were agreed with Linden Homes and a conditional sale contract entered into. The contract included provision for sales revenue and area overage, and took into account an historic land covenant linked to an overage payment on part of the site. Vail Williams’ commercial property planning consultants were instructed to secure planning at the buyers cost which resulted in securing a detailed planning consent for 23 dwellings and a convenience store, enabling the sale to be completed at circa £3 million.